On the Italian island of Lampedusa, digital phones automatically set themselves to Tripoli time—perfectly rational clock behavior in a place 120 nautical miles from Europe’s coast, and only 70 from the edge of Africa. Here, a warm Sirocco wind blows over the small island and, long before summer, the sun shines strong enough to cook up a tan in a morning. On the southernmost tip of the island, a sculpture of an open door greets the sea. It’s called La Porta d’Europa—the door of Europe. Lampedusa is the Mediterranean at its best: Turquoise waters surround the island’s 22 square kilometers (about 8 miles), and its white sand beaches are mostly empty. Its most beautiful beach, opposite an islet known as Isola dei Conigli (Island of the Rabbits), is a natural reserve, far from any car parks, or coffee shops. This beach is world-famous for two reasons: The first is the rare Caretta Caretta sea turtle, whose babies hatch on the sand and march into the sea. Its other claim to fame dates back just five years ago to Oct. 3, 2013, when at least 366 people drowned (link in Italian) in a shipwreck just offshore. Like its sculpture, Lampedusa is known as ”the door of Europe.” Over the past 20 years, an estimated 400,000 people have crossed the Mediterranean to arrive on Lampedusa. At least 15,000 have died trying. For the rest of the world, each tragedy has been an emergency: cause for shock, outrage, and eventually, amnesia. But for the residents of Lampedusa, this string of arrivals and disasters is just life—no longer shocking, but impossible to ignore. From fishermen to housewives, from activists to military personnel, everyone here has a role in and an opinion on Europe’s so-called migrant-crisis. Every year, more people try to cross the Mediterranean. And the number of drownings keeps climbing. 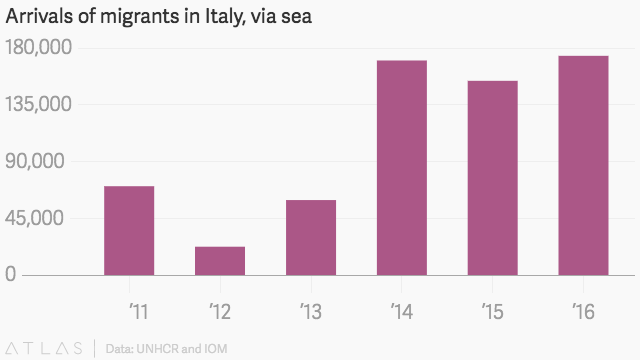 By the end of 2016, over 4,500 people die trying to reach Italy, more than ever previously recorded. 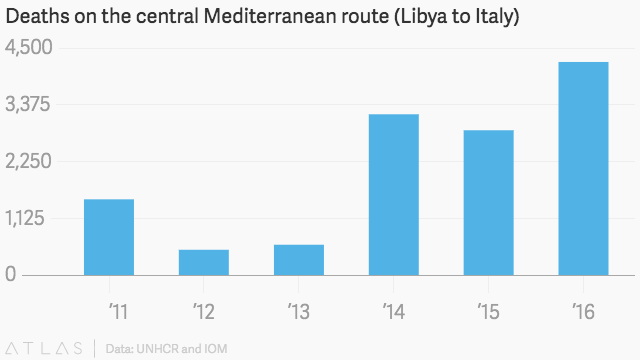 The path from Libya to Italy is the deadliest of migrant routes. Her call for help went unheeded until the tragedy of October 2013. Then, the Italian government directed more funds to local search and rescue programs: Mare Nostrum, a mission financed by the Italian government with a budget of €9 million ($9.6 million) a month, was managed to curb deaths at sea between 2013 and 2014. It was replaced in 2014 by Triton, the largest EU mission in history. But with a monthly budget under €3 million, this was a much smaller and less effective endeavor. Every year since 2014 has been deadlier than the previous. In a country that has little sympathy for immigrants, the citizens of Lampedusa have, through the years, stood out for their compassion, often without support from the mainland government. In the winter of 2011, when some 11,800 to 23,000 Tunisians arrived on the island, dwarfing the local population of 6,000, many Lampedusani volunteered their own food, blankets, and whatever hospitality they had to offer. In 2016 (as in 2011, and 2014), Lampedusa was nominated for the Nobel Peace Prize along with the Greek island of Lesbos. But many on the island don’t feel like heroes. “A Nobel prize should be given to those who have a vision for the future,” says Mimmo Zambito, the island’s priest. The island, he adds, is only reacting decently to a tragic state of things. Lampedusa performs two key roles in addressing Europe’s infamous “migrant crisis”: rescue, and migrant intake. Rescue is where Lampedusa stands out. Of the twenty emergency boats that Italy owns that can operate even in the worst weather conditions, four are in Lampedusa. They go out to sea with a crew of five, plus a sub, a doctor, and a nurse—both typically volunteers of the CISOM, the Italian rescuing corp of the Order of Malta. They have a capacity of 120, but sometimes exceed that, due to the nature of their work. “In extreme cases we’ve embarked even 250 people,” Monaco says, “it’s too many [people to have on board] but when you have to decide between life and death we naturally do what we can.” The people who arrive in Lampedusa—and, generally, in Italy—mostly come from various African countries: Nigeria primarily, then Eritrea, Sudan, Gambia, and a few from countries in the Maghreb. Men and boys make up 70% of arrivals in the country. Minors make up 15% (pdf, p.46). From those boats, rescued migrants are often transferred to another, larger vessel, where they receive first aid, and are checked by a doctor to make sure they don’t have infectious diseases. The vessels then take them to one of Sicily’s harbors, to be identified, and start the long and complicated process of applying for asylum. A few of the rescued migrants are taken to Lampedusa. There is one intake shelter on the island, the first of Europe’s so-called hotspots, meant to quickly process migrants within 72 hours and distinguish asylum seekers from economic migrants. Built in 2007, the shelter has an official capacity of 450 people, but it’s not uncommon for it to host over 1,000. In the peak of summer 2016, more than 1,700 migrants (link in Italian) were hosted there, including many who refused to register for asylum. Through the years, horror stories have come out of the shelter. In 2013, a report showed migrants being abused, which lead to an investigation. The shelter was assigned to a new managing company in the same year. Still, the center is often a site of protest—exasperated by their living conditions, migrants have set the building on fire three times in the past seven years. There is nothing much to do at the shelter—not even a TV to watch, is a common complaint—and so the authorities turn a blind eye on the “hole in the net,” through which residents sneak out. Those are the moments when they’re visible—taking a stroll through town, praying in the church, or selling cigarettes. According to a few local fishermen, some men receive small packs of cigarettes in the shelter, and sell them at €1.50 ($1,7) for packet of 10—€0.7 under the market rate. Sami, 20, is one of them. He hangs out with a few young men and women (between 17 and 22), who have been on the island for a few weeks. They come from Somalia, Nigeria, Eritrea, Guinea, and speak different languages, though Arabic is the lingua franca. Originally from Eritrea, Sami says he worked in a bakery in Tripoli before making the trip to Europe. His family is waiting for him in the UK, so he has refused to give his fingerprint to Italian authorities for fear of getting stuck in Italy as international law would require. “My friend! My friend!” says Sami, excited at the prospect of someone who might speak something else than Italian, when he sees a new face. But it doesn’t happen often: he and his mates are usually confined amongst themselves, with the exception of the rare football match between locals and guests of the shelter. Before the search and rescue operations were as structured as they are now, Filippo Solina, a 48-year-old fishermen from Lampedusa, remembers rescuing migrants on fishing trips. Filippo Solina says he and his crew rescued hundreds of migrants. Solina speaks a tight Sicilian dialect and has been a Lampedusa fisherman since he was little more than a child. About ten years ago, he remembers, he was out fishing at dusk, 40 miles from the port, beyond the area he was allowed to enter, when he was reached by call for help from a clandestine boat with 230 on board. The other boat was taking on water, and its passengers didn’t have lights to signal their presence. Solana didn’t have the capacity to take all of them on board, but worried he’d get a fine for fishing illegally if he called for help. Lampedusa’s fishermen have a love-hate relationship with the island’s Coast Guard: Although the authority has long relied on their seafaring expertise to help out with humanitarian rescue missions, it also fines their misconduct as a fishermen. Andres Barreca, a fisherman, is part of Maurizio Brichetto’s crew. “But what the heck do I care, I can’t leave the children here with a sinking boat,” Solina remembers thinking. He called the coast guard. Help arrived at midnight, but the rescue ship was too big to approach the migrants’ boat without endangering it. Fishermen Maurizio Brichetto and Filippo Solina, remember rescuing migrants off she shore of Lampedusa. “I did things properly,” he says. He went back and forth from the main ship to the migrant’s boat till eight in the morning, ferrying passengers to safety. Afterward, he says, he was not fined. Instead, he was allowed to take leftover fuel from the migrants’ boat and sink the boat afterward: an old trick fishermen use to harvest fish in specific locations. Solina estimates that he and his crew have rescued around 3,000 people, over the years. Since management of the Mediterranean migrant crisis shifted into the hands of state and EU authorities in 2013, the fisherman and other locals see few new arrivals. Today, it’s not uncommon for migrants to receive assistance from an Italian- or Frontex-led rescue mission just a few miles off the coast of Libya. This change in rescue strategy has prompted a shift in smugglers’ strategy: Many human traffickers have begun putting more fragile vessels to sea with the expectation of rescue. With the right timing, once those boats inevitably capsize, EU coast guard race to the rescue, turning humanitarian work into a de-facto extension of a carefully constructed human trafficking network. In the museum of migration, some of the objects left behind by migrants. After preliminary processing in Lampedusa, few arrivals actually choose to stay. Only 35 people of African origin live in Lampedusa today. ”No one [of the migrants] stayed here, fell in love, had a child, or started a business,” says Don Zambito, the island’s priest. Today, even when dead migrants arrive in the island’s harbor, they are not buried on Lampedusa: The local cemetery is too small, so corpses are buried in other towns—mostly in Sicily, sometimes in other southern regions. Only a few graves, of the first who died trying to cross, still remain. Years after they were buried there, there are still fresh flowers to remember their tragedy. The old graves of migrants in Lampedusa’s cemetery. A local group of activists called Askavuzi has opened a “Migration Museum” in a cave near the city center. Inside are life vests, plastic bottles, pots, old tapes collected from what migrants left behind, mostly dating back to the 2011 emergency. But the exhibits looks at the migrant experience with a sort of compassionate voyeurism, distanced by time and by the well-oiled rescue machine that now runs parallel to life on the island. There is only one resource that all locals and all migrants share: healthcare. Pietro Bartolo, a gynecologist charged with all healthcare in Lampedusa, manages a team of 24 doctors serving the island. Six of those doctors are also on a team that visits migrants who are processed on the island. Bartolo was there in 1991, for the first arrivals. He was alone for the first few years, when there was little in the way of organized intake of migrants. In 1997, he remembers, the first shelter was opened inside the airport. As the number of annual arrivals rose over time, so did his team’s size. A group of migrants temporarily housed in the shelter, sits by Cala Guitgia, Lampedusa. Bartolo describes ”rubber boat disease” as a chemical burn caused by a mix of water seeping into inflatable dinghies and petrol leaking from them. The mix frequently covers the bottom of rescue boats, soaking clothes (mostly women’s, he says, since they sit on the bottom of the boat), and burning the skin. “When they don’t die, [these people] remain disfigured for life,” he says. One evening in May last year, excitement was palpable in Lampedusa. In the town center, a pop-up movie screen is set up, and movie posters all over announce a screening at 9 pm. In front of the screen, 500 chairs await. The first screening of Fuocoammare in Lampedusa. Before (and after) the projection, local band Mamma li Turchi played a 1940s song about the island. It was a joyful retro tune titled Focommare (a Sicilian dialect expression meaning ”fire at sea”). The movie being screened, Fuocoammare, is named after it. Directed by Gianfranco Rosi, Fuocoammare is a two-hour long documentary that explores Lampedusa through the eyes of Samuele, a 12-year-old boy from Lampedusa. Awarded the Golden Bear at this year’s Berlinale film festival, and now Academy Award nominated, it is a poetic portrait of the island—characterss include a housewife, and a man who runs the local radio station—against the looming, tragic background of migrant arrivals, and deaths at sea. Linking the two worlds is the doctor Bartolo—who takes care of locals just as he does of migrants—alive, and dead. The film juxtaposes the simple life of an island that seems stuck in another time and the tragedy of migrants daring death to reach Europe. The same contrast was visible in Lampedusa’s main square. Before the screening, some of the main characters got on a stage set up in front of the screen, to the thrill of their fellow islanders. In the back seats, among the spectators, were migrants, too. “J’ai pleuré,” said a young man from Guinea, the next day. “I cried.” He and another young man from Guinea are strolling past Lampedusa’s harbor, wearing the tracksuits given to migrants on arrival. Both have been staying in the island’s shelter for just few days. Neither knows how much longer it will be until their transfer to the mainland.